La Posada de Santa Fe, A Tribute Portfolio Resort & Spa is said to be haunted by the ghost of Julia Staab. 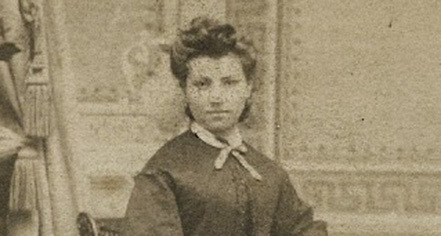 Julia Staab was the wife of Abraham Staab, the wealthy merchant who built his three-story brick mansion in 1882 on the property that now belongs to the resort. They lived together at this residence with their seven children for several years, until Julia’s death in 1896 at the age of 52. The first sighting of Julia’s ghost came in 1979. A janitor was mopping when he noticed a woman in a black Victorian dress, her hair pulled back into a severe bun. This was followed by several more stories of resort staff noticing the same woman, disappearing as suddenly as she appeared. In one particular instance, she was spotted wandering the hallways by a security guard, who immediately took off running. Despite this, Julia’s ghost is not described as unsettling or frightening. Recorded sightings of the ghostly activity includes gas fireplaces turning on and off, swaying chandeliers, and items in certain guestrooms being moved. A bartender once stated that on a particularly busy evening, all the glasses on a particular shelf flew off and crashed to the floor. During her life, Julia loved gardening and decorating the house with roses and some visitors have mentioned the distinct smell of roses lingering in certain areas of the building. All alleged activity is confined to the former Staab House, so guests staying in the newer accommodations have never reported any experiences. Many visitors who have had these supernatural experiences stayed in Room 256, also known as Suite 100, which is the room Julia Staab used during her life.